Nice :) But no... making pani-puri is very easy and quick. Try sometime! One thing you have missed out is the amount of efforts these puris take. These people have really hard lives. Most of these people wake up 4AM in the morning and work until 2PM to get these puris ready. Then they start moving to their usual places. It can get very difficult to break-even and move anywhere ahead in life, if one keeps doing this. One trivia: One story says that Pani puri had originated in South Bihar, which was formerly the Magadha Region (mostly by migrated people). Another story says that it was created by a team of hakims and vaidyas to administer medicine to Nawab Wajid (Lucknow), to cure an upset stomach. Since that gourmet fellow would not have taken the medicines as such, it was given as spice in the water and filling. I did not include all of this because it doesn't fit the context of the post. I am sure their job is difficult. Hahahaha. 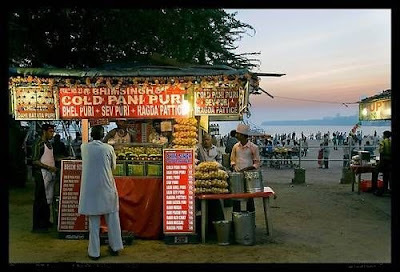 To be honest just because of paani puri I m able to read and clearly understand the whole blog post and the concept of laissez faire.